Londonderry – Although a trial lawyer in Boston by day, Alan Hoffman is a self-described "Lafayetteophile." Nothing satiates his appetite for learning every tidbit he can about Marie Joseph Paul Ives Roch Gilbert du Montier — a legendary Revolutionary War hero better known as Gen. Lafayette who toured the United States, even making a stop in what is now East Derry. For more than two years, Hoffman, 62, sat at the dining room table in his Londonderry home translating Auguste Levasseur’s Lafayette in America in 1824 and 1825. "Lafayette was like a rock star during that trip," Hoffman said. "He must have visited 400 to 500 towns and drew crowds everywhere he went. People gave him wreaths of flowers and grand receptions." Lafayette was born in France in 1757 and orphaned at age 2. He joined the French military and sailed to South Carolina at 19 to fight in the American Revolution against the British. He was introduced to George Washington in a tavern in Philadelphia and it was the beginning of a strong friendship. "Washington considered him an adopted son," Hoffman said. Lafayette joined the ranks as a major general under Washington and led American forces to several victories, leading up to the surrender of the British at Yorktown after the Battle of Chesapeake Bay. Lafayette died in 1834, just a decade after his much-feted tour of the United States. Hoffman became hooked on Lafayette after asking his brother-in-law to give him a book on the famous general for his birthday on September 16, 2002. "He gave me a biography by Harlow Unger and a museum catalog from an exhibit called ‘Hero of Two Worlds.’ It was shown at the National Heritage Museum in Lexington in 1989," Hoffman said. "By the way, Lafayette’s birthday is near mine. His is September 6. I guess we’re both Virgos." Hoffman then read another book, "America’s Jubilee," a social history of the 50th anniversary of the nation’s independence written in 1826. "The first chapter, about one tenth of the book, was about Lafayette’s trip in 1824 and 1825," Hoffman said. "It talked about him laying the cornerstone of the Bunker Hill Monument and other events. I was a history major in college, but my knowledge of Lafayette was limited." Hoffman was on a mission. He enlisted the help of his sister, who found on the Internet that there was a copy of Levasseur’s two volume book at the Brattle Book Shop in Boston. "I went to the store and they sat me at a table with this book," Hoffman said. "I opened it up to the preface and to my surprise, I could understand the French." It was October 2003, and Hoffman purchased the book for $450 and began translating the 1,130 pages using three French dictionaries. "I actually wore one (of the dictionaries) out," he said. "I took French for six years from grades seven to 12 and never really liked it. But my mother kept all the report cards and I discovered that I received A-pluses in French." Hoffman grew up in Brooklyn and received his undergraduate degree in history at Yale. He then attended Harvard Law School. In 1984, he and wife Marilyn, moved to Londonderry. They have two children, Adam, 23 and Elena, 20. What began as a hobby turned into a two-year endeavor as Hoffman translated the adventures of Lafayette, as told by Levasseur, throughout the 24 states of the young nation. Around his home are drawings, posters, and painting of Lafayette, piles of folders with side notes. "He was one of the first people to travel the Erie Canal," Hoffman said. Although it’s not written in this account that Lafayette visited the area, Hoffman found another "Lafayette, Guest of the nation" written by Edgar Ewing Brandon in the 1940s and 1950s. "In the fifth volume that was unfinished, he wrote about Lafayette visiting Reading, Andover and Methuen, Mass., and stopping in what was Londonderry back then," Hoffman said. "Today, the area is East Derry and he visited the Adams Female Academy in June of 1825 on his way to Concord." Hoffman said there were two interesting things he learned during his translation that grew into a 9-inch stack of white-lined paper that later became a 572-page book with a 27-page index and a pullout map. "The first was his close and affectionate relationship with the Founding Fathers," Hoffman said. "Like Jefferson, Madison and Monroe. He actually stayed for a month at the White House at the end of his trip. John Quincy Adams was president. He and Winston Churchill are the only two non-Americans who ever spent time at the White House." Secondly, Hoffman was impressed with Lafayette’s relationships with blacks and American Indians. "The Abolitionist Society in New York made him an honorary member," he said. Hoffman said that when he first took on the project, his wife was a little nervous. "She is fluent in French and she was concerned that I would pester her," he said. "I made it a point not to." Marilyn Hoffman does have a sense of humor, though. "She write on our 2006 holiday letter, "Alan has morphed into an 18th century French general," Hoffman said. Surprisingly, a friend sent back an obituary to Hoffman that read, "A Man Who Knew Lafayette Dead." It was an obituary of David Kramer, a great grandfather of the friend who met Lafayette during the 1824 -1825 visit when he stopped in Philadelphia and waves of schoolchildren went to see him. "That was how great the guy was," Hoffman said. "Imagine that as a headline to an obituary." 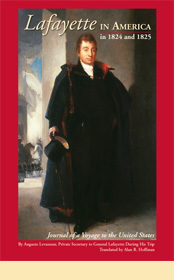 Hoffman’s book has sold 400 copies in its first printing of 1,000. He expects to print 2,000. His publisher? Lafayette Press Inc. in Manchester.